The National Cancer Institute defines an oncolytic virus as a type of virus that infects and lyses (breaks down) cancer cells but not normal cells. These type of viruses are naturally present in the body and also can be manufactured in the laboratory by adjusting other viruses. Because of the nature of oncolytic viruses, they are being studied for use in the treatment of cancer. Oncolytic virus therapy may be easier to treat cancerous cells with chemotherapy and radiation therapy. Chemo and radiation therapy have complicated side effects that virus therapy does not have. Simplified model for oncolytic viruses. A virus engineered to preferentially replicate in tumor cells is delivered to a tumor. 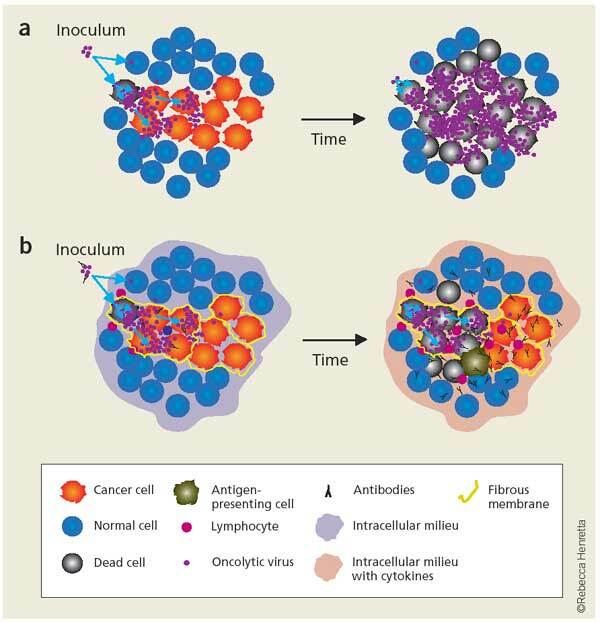 The selectivity for tumor cells may be conferred by targeted infection to tumor cell receptors or by making initiation of the virus replication cycle dependent on tumor cell specific conditions. Two Ottawa researchers are taking innovative approaches to improving virus-based cancer therapy with new funding from the Canadian Cancer Society. Viruses that selectively target and kill cancer cells, oncolytic viruses, are an exciting new avenue for treating cancer because healthy cells are spared and side effects are reduced. The problem is that many tumors are able to protect themselves by unleashing defense mechanisms that disarm these viruses. Two researchers are each tackling this problem with creative approaches that involve delivering the viruses in combination with new drugs to make the treatments more effective than either would be alone. Dr Jean-Simon Diallo of the Ottawa Hospital Research Institute is receiving $200,000 to study the use of a specially engineered virus given in combination with a novel type of drug to help the virus overcome the tumor's defense mechanisms. Using a unique mathematical model, he will use results from this newly funded research to predict the success of other drug-virus combinations. Dr Diallo's highly innovative research proposes a creative solution to disarming tumors' defense mechanisms with novel drugs, while also accelerating development of oncolytic viruses through mathematical modeling. Dr Robert Korneluk of the Children's Hospital of Eastern Ontario is receiving $200,000 to study whether the defense mechanisms that tumors use to protect themselves from viruses can be turned against them. Dr Korneluk is studying a group of experimental drugs that are highly effective in killing cancer cells, particularly in the presence of a specific compound. This compound is produced both by the immune system and by cancer cells and can result in actually protecting the tumour cells from viruses. In Dr Korneluk's innovative project, he will test whether, when given in combination with a cancer-killing virus, these experimental drugs can effectively destroy cancer cells. Dr Diallo and Dr Korneluk are two of 15 Ontario scientists to receive new funding for unique and creative research, the Canadian Cancer Society announced today. "Ontario continues to produce innovative research that ranks among the best in the world. We are proud to support these new projects because they bring a unique perspective in our fight against cancer," says Mary Argent-Katwala, Director, Research, Canadian Cancer Society. "We keenly anticipate the impact that the research will have on the lives of all Canadians." A total of 28 grants representing a $5.4 million investment across the country were announced today. The Canadian Cancer Society is the largest national charitable funder of cancer research in Canada.